Now that Hillary Clinton has testified about Benghazi attacked, all the people who accused the Secretary of State of faking a concussion to avoid testifying owe her a HUGE MASSIVE apology. We're waiting... but I wouldn't hold my breath. Former Congressman and present-day Harriet Tubman reincarnate Allen West: "I'm not a doctor, but it seems as though…the Secretary of State has come down with a case of Benghazi flu... I think we have to get to the bottom of this. There's still a very countless amount of unanswered questions." Former U.S. ambassador to the United Nations John Bolton: "When you don't want to go to a meeting or conference or event you have a diplomatic illness. And this is a diplomatic illness to beat the band.... This was revealed in a way that I think was not transparent.... She may beat testifying this week, but she's not going to escape it forever." Fox News' The Five's Kimberly Guilfoyle: "This is a duck and cover, let's be honest and the Clintons are great at this... I'm almost admiring it except for the fact that we need her testimony. This is completely quintessential classic Clintonista behavior and she doesn't want to answer the questions." The Five's Greg Gutfeld: "How could she get a concussion, when she's been ducking everything.... I wanna see a doctor's note." The LA Times ran a poll called "Did she fake it?" The New York Post, which called Hillary's concussion a "head fake." Conservatve radio host Laura Ingraham "joked" it was an "immaculate concussion." Fox News' Bill O'Reilly, who laughed and laughed at Ingraham's joke because it was just that funny, said, "That's good, did you make that up?" Charles Krauthammer: "[Clinton] is suffering from acute Benghazi allergy which causes lightheadedness when she hears the word 'Benghazi.'" Fox's Megyn Kelly: "What's really going on? I mean, she fainted sometime last week and can't show up this Thursday for a previously scheduled testimony? I mean, there was speculation, I want all the viewers to know, about whether she'd really go [to testify].... there is a legitimate question about, is — do we believe this is an excuse and that she really will show up to testify?" Fox's Monica Crowley called Clinton's illness "this virus with apparently impeccable timing." The Daily Caller's Jim Treacher: We're told she collapsed and hit her head and got a concussion, and that's why she can't testify about Benghazi this week. And we're supposed to just take her word for it.... If it's true she has a concussion, let's see the medical report. Let's see some proof that she's not just stonewalling. National security spokesperson (for a minute because he's gay) for Mitt Romney Richard Grenell Retweeted, "Help! 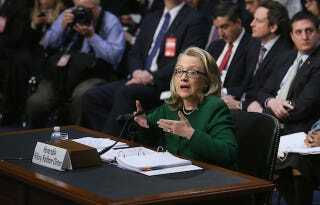 I've fallen and I can't testify about Benghazi!"